It's lovely to have a wicker basket to transport your champagne and glasses to a favourite destination but it's another thing to have the ability to keep it cool while travelling in the heat of summer! The chilled wicker champagne basket with 12 glasses keeps your bottles cool and your glasses upright so you're well prepared for an afternoon of frivolities with friends and family. 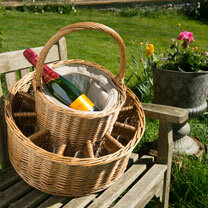 Great as a wedding present and for summer parties, the wicker champagne basket is a real head turner and the only way to safely transport champagne and glasses while keeping your bubbles cool. 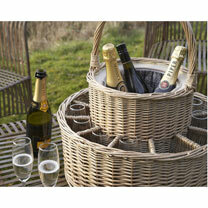 Basket size: diameter 46cm, height 21cm (52cm including handle) approximately. Glass size: 17cm including stem and holds around 250ml approximately.